All About Jazz has a nice piece on the recently re-released DVD's of the Dixie Dregs and the Steve Morse Band. Dixie Dregs - Live at the Montreux Jazz Festival 1978, and The Steve Morse Band - Live in Baden Baden Germany March 1990 were both released a couple of years ago, but were recently re-released domestically by Eagle Eye Media. This was posted on the Steve Morse Mailinglist Yahoo Group, and I just had to put it up here. 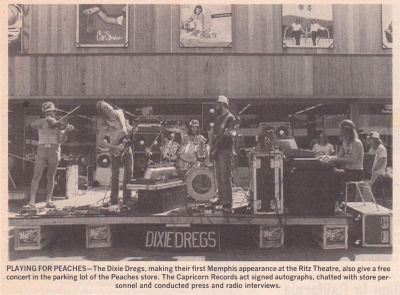 This photo of the Dixie Dregs was taken in 1977 in front of Peaches Records in Memphis. This originally appeared in Billboard magazine. 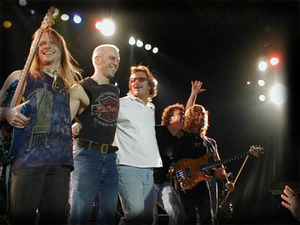 From left to right: Allen Sloan - violin, Steve Morse - guitar, Rod Morgenstein - drums, Andy West - bass, and (probably) Mark Parrish - keys. The DIXIE DREGS MONTREUX JAZZ FESTIVAL 1978 DVD has been released. Currently you can get the Australian Region 4 version DVD here, in either NTSC or PAL. Amazon.com will have the Region 1 version on July 12th. UPDATE: I finally got around to getting this. Check out my review here. Last night I saw the Dixie Dregs at the Park West in Chicago. Everyone got a double-dose of Morse as it was the Steve Morse Band opening for the Dregs. Both shows were great! They aren't promoting a new album, so there weren't many surprises. However, the Dregs played Mahavishnu's "Celestial Terrestrial Commuters" which was a big surprise, and very cool. Morse plays on that tune for the upcoming Mahanishnu tribute album. "Rising Power" was the highlight of the SMB set for me. They always stretch that tune out live. In the Dregs set, "Kat Food", "Ice Cakes", "Celestial Terrestrial Commuters", and "Kashmir" were all particularly awesome. Morse played a purple sunburst Ernie Ball with white trim and white pickups on a couple of tunes as well. For the Dregs encore, Van Romaine (drums with SMB) came out and did a drum duet with Rod Morgenstein.Very cool! The rest of the band then came out and they did "Bloodsucking Leeches" with both drummers. They've done that before when SMB has opened for the Dregs; it was awesome as always. It was great to see Morse and the Dregs again. They haven't been through Chicago in a few years if I'm not mistaken. The official Steve Morse website has lots of pictures and setlists covering practically every Morse and Dregs tour ever. All Morse fans need to check it out. They will get some submissions regarding this show I'm sure. Some new Steve Morse Band/Dixie Dregs shows are coming up!